We started in Vancouver, B.C. making skimboards, then we made t-shirts to promote the skimboards. The shirts were easier to make/sell so we ditched the skimboards. We started contract printing for friends and contacts and discovered the difficulties that people have organizing group orders. That formed the basis of what has become the Navigate Apparel you know today! Brendan and Bryan on the beach in Westport, WA. 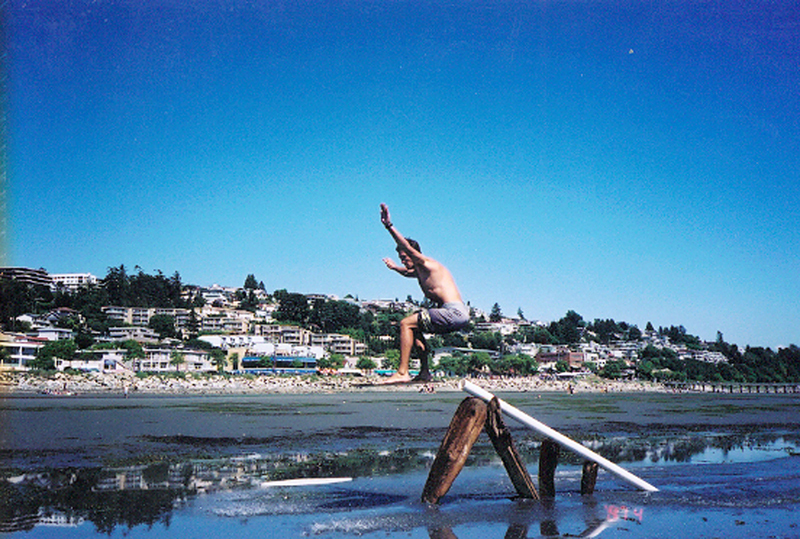 Summer of 2004 – I was off school from the University of British Columbia in Vancouver and spending the summer in my hometown of White Rock, BC. The beaches of White Rock and Vancouver are perfect for skimboading – the long flat beaches reveal thousands of shallow tidal pools that stretch on as far as you can see. That summer, I’d decided that I was going to take up skimboarding again – it was a good way of training for Rugby and also just a fun way to spend time during the summer. My dad (the wood shop teacher at the local high school) had made one for me when I was a kid. I’d always liked building things so started researching how to best put one together for myself. I made a mould to form the layers of plywood into just the right shape, learned how to apply fibreglass and stencilled a design onto the top of the board and we were good to go. Skimboarding is a naturally social activity – it’s more fun with friends and always draws a few onlookers – mainly families with young kids who can’t figure out how you’re doing what you’re doing. 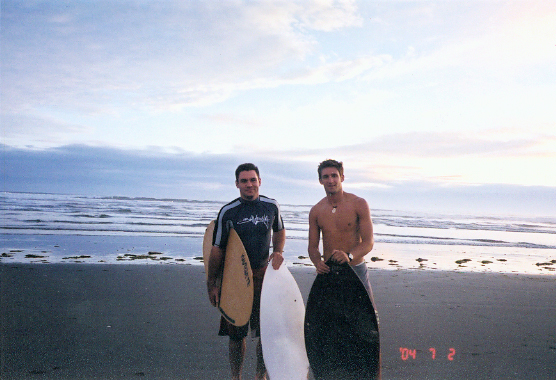 I’d spend countless hours at the beach skimboarding with Bryan Sommer and Simon Jose – both of them really liked the board and were constantly asking to borrow it. Simon was the person who actually realized this might have some potential – he’d borrowed my board for the evening and called me the next day tell me he didn’t have my board anymore but in it’s place he had $140 that a father had paid him on the spot for it. Simon wanted to know if I could make some more. I started making some more boards and would drop them off to people Simon had met on the beach and taken orders from. Simon – my first sales rep left me after a few short weeks to travel Europe – probably a much better idea than sticking around to sell skimboards and wait tables. At that point I’d realized that I was much better at building skimboards than I was at riding them – and having someone who could actually ride the things would be helpful to drive sales. I recruited Bryan (pictured below) into the company and Navigate Skimboards was born. In the fall, school started back up and I moved into a house in Vancouver with some friends. Bryan had finished up at UVic and was now living in downtown Vancouver. After a couple weeks, with the help of my dad, we converted the carport at the back of my house, turned it into a workshop, and started production in earnest – this was a big step up from my dad’s driveway. We spent the next year cranking out skimboards as fast as we could – we had been gluing a layer of Arborite (the kitchen countertop material of the 90s) on the bottom of each board. This made the boards incredibly fast and much more durable than the other boards on the market. This differentiation set us apart and we were soon selling boards as fast as we could make them – albeit with a 1-2 person production team may have not been so quick, either way, we were busy. I learned some basic web design and photoshop from a friend and threw together a rudimentary website. Sometime the following summer (2005) we came up with the idea that we should make some t-shirts to promote the skimboard line. We’d already learned the basics of screenprinting in order to reprint designs onto the boards – how hard could t-shirts be. We setup the first run on an ironing board in the basement and started experimenting on some t-shirts we’d ordered online. The first efforts were basic at best – we had waterbased inks from Opus, an art store in Granville Island and we went to town creating 1 colour prints of our name and an silhouetted image of Bryan on a board. As basic as they were, the shirts were popular amongst our friends so we kept making them. After spending the last two summers making skimboards in a hot, fibreglass filled garage, printing t-shirts was easy – and they were much easier to sell during the winter months. We realized that the skimboard game was a little limited in terms of potential – you had a limited window for sales and even then the market for boards wasn’t huge. We decided to make a change and focus our efforts on becoming a lifestyle brand – Westbeach had exploded while we were in school so it seemed like a good way to go. One thing that was for certain was that screenprinting capabilities weren’t going to cut it. We started looking for printers and managed to find a company that would put up with our inexperience and tiny order sizes. The first couple of runs of shirts went quick – we were selling mainly to our friends and family – easy sales. Once we’d worn out that market, things slowed down somewhat. We’d also had some quality issues with our printer – the first realization that not every printing company does great work. With all this, Bryan and I started to feel like we needed a new angle to move shirts – we toyed with the idea of trying to sell through retail stores but we were nervous about putting through an order large enough to get our costs down to the point where we could reasonably expect a store to stock our brand. Things kind of died down for a bit while we tried to move inventory so that we could use the money to make more shirts. During that time I’d been spending a lot of time researching screenprinting – basically learning all the things that we’d been doing wrong when we started. Through that research I worked out plans for the equipment we needed and built a living room sized screenprinting setup – a massive exposure unit with a neoprene vacuum table and a 30,000 watt Metal-Halide bulb that would hum like a generator anytime you used it. We also had a screen curing unit, a solid 1 colour press, and proper aluminum screens in varying mesh counts. I was making weekly trips across the border to Point Roberts to save international shipping costs on our supplies as well as buy cheap gas and 12-packs of even cheaper American beer that we’d drink while cranking out t-shirts in my Kitsilano living room. At this point – I’d be remiss if I didn’t give some thanks to my roommate Eric Dewolf at the time for his patience/understanding with me for effectively turning our living room into an industrial manufacturing zone. Thanks pal! With the new printing setup, we were much more flexible and started printing/selling shirts again. Over time we started to get more requests for contract printing – rugby 7s tournaments, hockey teams, etc – coming in through friends that we’d churn out every week. During this time, we’d decided we needed to be something more than a lifestyle brand – we looked possibly becoming a site that focused on helping people achieve certain goals – something we would have found helpful when starting out with Navigate. The main idea was to interview people who had made their mark in a certain area about how they got started and any advice they had for those getting started. We’d release the interview in conjunction with a t-shirt designed in partnership with the interviewee that would raise funds for a charity of their choice. We had a couple good goes at this format – Hutch somehow used a family connection to wrangle an interview with a pre-“Call me Maybe” Carley Rae Jepsen – I think our claim to fame at that point was that we were her first Canadian interview. We also worked with Canadian Paralympian Slalom Skier Melanie Schwartz during the 2010 Paralympics in Whistler, BC. We were still getting orders for contract work but we were also learning the valuable lesson about working “in” the business instead of “on” the business. We were pumping every dollar back into the business and the time spent printing shirts every week was starting to wear on the three of us as the volume of orders coming in grew. At this point we were all starting our post university careers and our attention was being pulled in a few different directions. I’d realized that printing in my living room wasn’t sustainable in the least – as such I’d begun canvassing places to begin outsourcing our printing. This time my experience properly printing shirts made the qualification process much easier – I knew what questions to ask, what to look for when visiting potential printers now which allowed me to steer clear of a couple potential problems. As this research was coming together, the three of us made a group decision to put Navigate on hold in order to focus on our individual careers. At this point, I had been the point person for most of the printing and kept getting inquiries for contract printing. Since I’d just figured out how to outsource the decoration, it was an easy decision to put it into practise and start running orders through. I continued to run Navigate Apparel as a custom apparel printer/embroidery/promotional products company for several years as a side business. 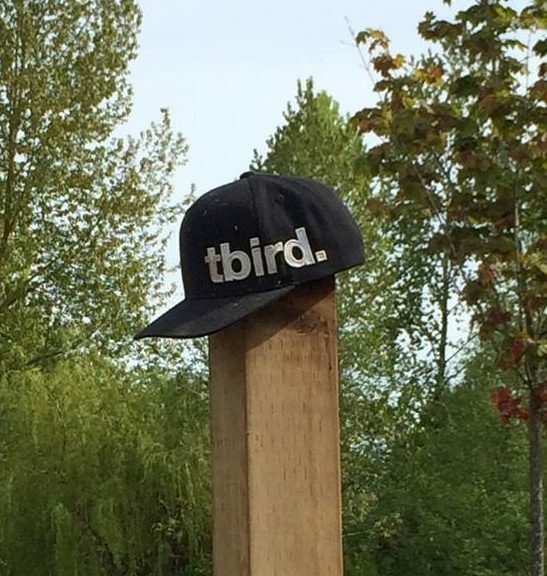 I spent most of the time working on projects with Thunderbird Show Park – building out their clothing line from a single, very popular hat to a full line of clothing that is incredibly popular on the Horse Jumping circuit. Between 2010 and 2013 I spent countless evenings after work and weekends at the now closed Calhouns Catering working out new designs and expanding and vetting the supply chain for Navigate Apparel in order to be able to find the highest quality decoration partners. During these years, I was also transitioning from rugby player to rugby coach – as such I was becoming learning what a hassle it was organizing custom apparel orders for a team of kids/parents. I spent way too much time packing t-shirts, collecting cheques, and chasing parents to come and pick up their kid’s order. I started experimenting with ecommerce solutions for team orders and began to formulate a plan with Navigate Apparel that would make team orders of high quality gear easy and quick for coaches, managers, teachers. Most of the solutions I’d seen at that point only got you partway there. They’d have gear but no order system – leaving me to dive through boxes filled with hundreds of t-shirts/shorts/socks to piece together a single order. Other companies had certain products I wanted but not others leaving a piecemeal solution that took way too much effort co-ordinating. Others had a full production line with all the gear, but at a much lower quality than I was willing to accept. I wanted the stuff the pros were wearing – Under Armour, New Era, Canterbury. So I went about establishing relationships with brands I trusted and had the highest standing in their various markets. In 2013 I moved to Central America and then Europe for the year – I continued working on Navigate Apparel during this time and finally got a new version of the website up while I lived in Valencia, Spain. In early 2014 I returned to Canada and made plans to expand Navigate Apparel east into Toronto where I began working full time on growing Navigate Apparel. I’ve been working since then to expand our network of decorators in both Vancouver and Toronto so that we can offer quick turnarounds to clients across Canada. Since then we’ve seen tremendous growth – highlights include winning the right to supply uniforms and merchandise for over 2500 volunteers at the 2017 Invictus Games in Toronto and the addition of Jason Jang as a member of the Navigate Apparel team. In 2018 we’ve continued to grow, we’ve increased our product range to include sublimation printed teamwear and jerseys while also rounding out our custom hockey jersey and team gear. We’ve also added capacity for larger orders through by setting up overseas manufacturing options to offer savings to clients on large custom orders. Thanks for taking the time to learn more about Navigate Apparel – the business has gone through a lot of changes over the years and we’re excited for the future and the chance to invite you along for the ride. If you’ve got any questions about Navigate Apparel or any of the work that we do – please get in touch and we’ll be happy to help you out. Owner – Navigate Apparel Inc.